The view from the passenger window of my car on Tuesday as I sat in traffic waiting for the cars ahead of me to move. It is another new section of the Dublin to Belfast road near Newry. The road runs close to the railway line at this point, alas there were no trains on the viaduct when I clicked. Conrad, Mayo and Ramana are but three who expressed an interest in visiting Ireland. So when I received this information I felt duty bound to pass it on ASAP! The capital of Ireland is Dublin. It has a population of a million people, all of whom will be shopping in Newry this weekend. They travel to Newry because it is in the North, which is not part of Ireland, but still pay in Euro. Belfast is the capital of Northern Ireland. It has a population of half a million, half of whom have houses in Donegal. Donegal is in the north but not in the North. It is in the South. No, not the south, the South. There are two parliaments in Ireland. The Dublin parliament is called the Dáil, (pronounced “Doyle”), an Irish word meaning a place where banks receive taxpayers’ money. The one in Belfast is called Stormont, an Anglo-Saxon word meaning placebo, or deliberately ineffective drug. Protestants are in favour of the border, which generates millions of pounds in smuggling for Catholics, who are opposed to it. 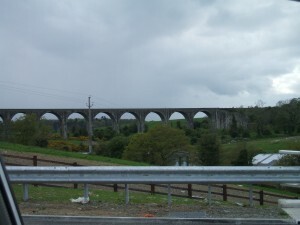 Travel between the two states is complicated because Ireland is the only country in the world with two M1 motorways. The one in the North goes west to avoid the south and the one in the South goes north to avoid the price of drink. We have two types of democracy in Ireland. Dublin democracy works by holding a referendum and then allowing the government to judge the result. If the government thinks the result is wrong, the referendum is held again. Twice in recent years the government decided the people’s choice was wrong and ordered a new referendum. All versions of the IRA claim to be the real IRA but only one of them is the Real IRA. The North’s biggest industry is the production of IRAs. Consequently, we now have the Provisional, Continuity and Real IRA. The Real IRA is by far the most popular among young graffiti writers simply because it is the easiest to spell. With thanks to Paddy for the email! This entry was posted in humour, Ireland on May 15, 2010 by Grannymar. Grannymar, I shall be most comfortable in this wonderful land. There are so many similarities between our land and yours that we must have been separated by a freak of nature! I am looking forward to my visit so that I can share my views on all the similarities. That’s a hoot! No wonder our visitors look more and more confused as we explain the intricacies of life in NI! And you haven’t even mentioned all our bizarre political parties and their incomprehensible squabbling! Ramana – I am sure you will fit right in here in Ireland. Nick – Local politics needs a post all to itself and I bow to you on that one! Brighid – No sweat… We Irish are just as confused! LOL! Love this post. Er… why is Elly ironing on the giant’s causeway? 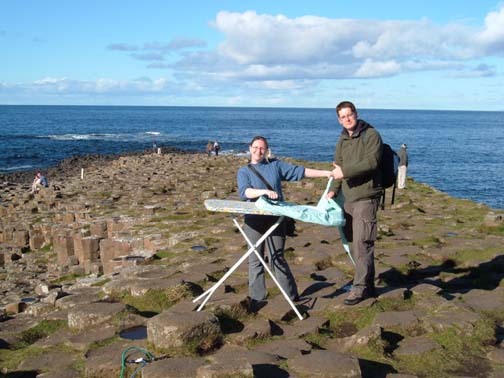 Geri – The guy in the photo was raising money through sponsorship for charity by ‘extreme ironing’ through England, Wales, Scotland and Ireland over a short few days. He climbed mountains and we met him at the giant’s causeway. Elly offered a donation in exchange for the photo. Impossible to explain Ireland to outsiders and Maude knows I’ve tried and tried. Love the ironing shot – brill!!! Steph – A different Paddy this time. Thanks for the link on the viaduct. WWW – Too right, it is impossible to explain. Only today I was asked about the Northern Ireland end of the recent Westminster General Election. The enquired asked “Who do you normally vote for? Labour, Tory or Libs?” He couldn’t get over the fact that we don;t get to vote for any of them. Our votes go to local politicians who at the end of the day have no real power in Westminster. I enjoyed and agreed with the PS! Thanks for the political lesson. Now I’m really confused. Before I only knew that the North & South (Did I get that right or is it the north & south?) didn’t get along. It was so much simpler that way. I used Hostelworld all the time but how come you posted 10 things to do in Dublin when you live in Belfast? And I’d be VERY interested to see how Ireland and India have anything in common! Haha! I read it again. Still confused but laughing at your humoUr. I realised I didn’t answer a question yesterday! 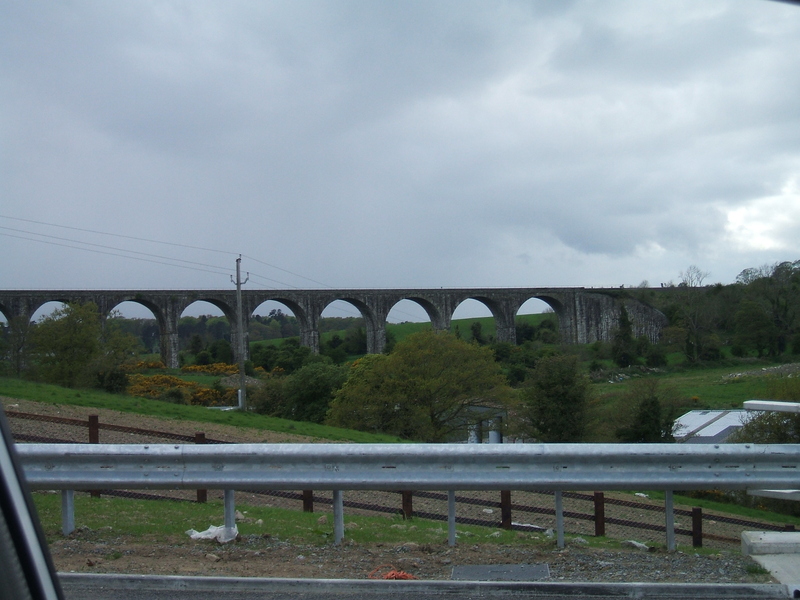 Baino – The two photos were from Northern Ireland, so I chose the Southern link from Dublin. Now, I’m properly confused and there is only one place that I know of where that causes no difficulty whatsoever … in a pub. So, when I get there and you need to explain things to me – which could be quite often, mind you – we will go to the pub and invite Elly to help iron things out. Conrad – As we say in Ireland… You’re on! I look forward to it. Funny post, GM. Maybe I would enjoy ironing more if I followed Elly’s lead to iron only in scenic surroundings? Nancy, The Giant’s causeway is not the steadiest of places to balance and ironing board The view in this month’s Header was taken from the point where Elly was standing.